Mac developers running OS X Yosemite will find Developer Preview 4 1.0 is now available to download from the Mac App Store. Additionally, the first beta release of iTunes 12.0 has been made available for developers, and an update to OS X Yosemite Recovery should also be installed. Each of these beta releases are intended for developer usage only, as they are not available to the public yet. The simplest way for developers to install OS X Yosemite Developer Preview 4 and iTunes 12 is through the Mac App Store Updates tab, run on a Mac that already has OS X Yosemite Developer Preview installed and active. Mac developers can also download a fresh copy of Yosemite beta by redeeming a promo code from the Mac Dev Center through the Mac App Store. 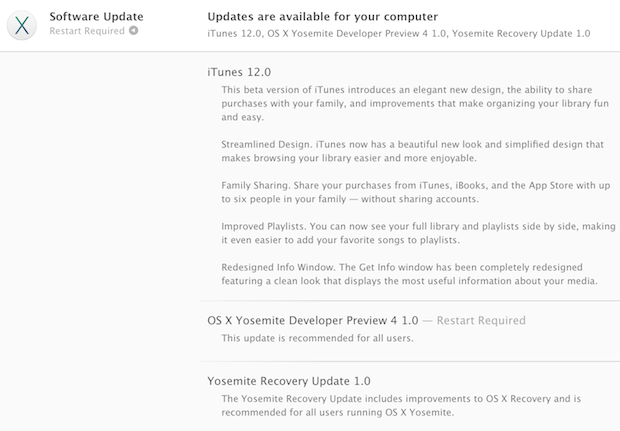 Release notes accompanying the download for OS X Yosemite Developer Preview 4 are short, simply recommending it for all users running the beta builds. Full release notes are available on the Mac Dev Center, and the new build mostly includes bug fixes and improvements to the beta release of Yosemite. iTunes 12.0 beta 1 offers the first look at the newly redesigned iTunes app. At first glance, the most obvious changes are a new icon and a generally flatter appearance, but otherwise it does not look much different from existing versions of iTunes thus far. OS X Yosemite features a visual overhaul of the Mac operating system and many new features, including increased compatibility with iOS devices. A public beta is set to be available within the next month or so, and the final release of Yosemite will be available to the public as a free download this fall. Separately, those registered with Apple’s developer program can also download iOS 8 beta 4 now from OTA update or the iOS Dev Center. The whole user interface is ugly. I only use it for apps that require 10.7 or better. Otherwise, I use Snow Leopard. Apple has lost their minds with this release for sure. Yeah… look at this interface on good IPS LCD panel. It looks amazing. You guys do realise that this is BETA? I personally love the dark mode, but of course that it still isn’t beautiful and shinny. It’s in beta, 3rd party apps don’t support it, etc. Wait for the RC at least and then judge the dark mode, beta is meant for testing purposes only so they can fix all these things. I love the new UI. Can’t wait for the final release. Looking forward to Yosemite looks like a few great additions to the OS! Over here in Finland, no matter what I do with OS X Yosemite Developer Preview 4 or Beta 1, iTunes12 just won’t show up on the Mac App Store or when booting up iTunes and looking for updates.